Enjoy a seamless leave request system that removes the need for calculations, date cross-checking and back-and-forth approval emails. Get your employees on our mobile app and automate your entire leave management process! Enhance transparency on leave entitlements, employee balances and team availability. Let us take care of your calculations and track all leave requests as they happen. Through Bayzat Benefits, employees can request leaves online and get them approved through the platform, removing the hassle of lost email threads, referral to cumbersome excel sheets, or the need to cross-check with different departments for approvals. Feel confident accepting or rejecting leave requests with Bayzat Benefit’s comprehensive Time-Off dashboard, which gives you full visibility on an employee’s current leave allowance, days of leave remaining, and whether other leave requests have conflicting overlapping dates. 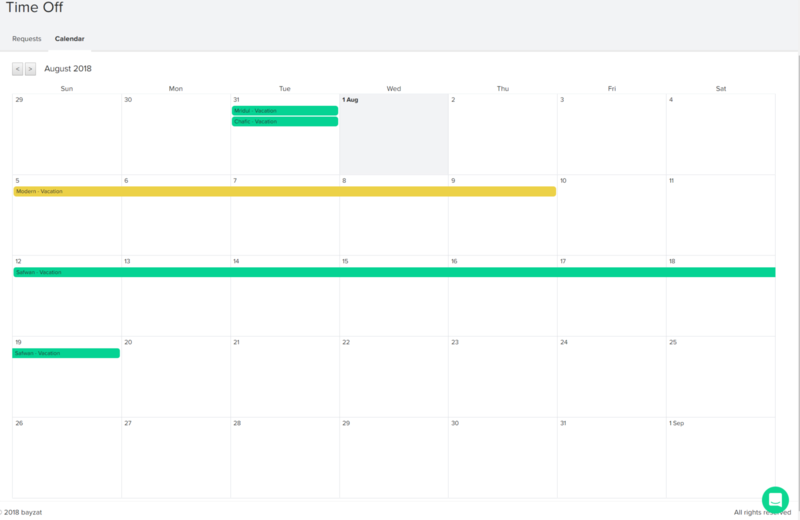 Gain more visibility on who are on leave and when by using our intuitive calendar view.